Original Vogue Doll Company 1997 Monogrammed Wood Dress Screen for Ginny. Vogue Bedroom accessory for 8 inch Ginny dolls. 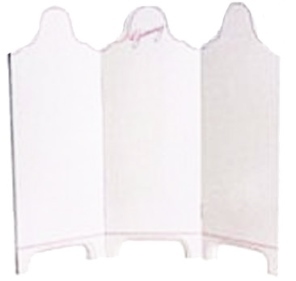 Vintage style creamy-white color Ginny foldable, hinged dress screen with pink trim. The three panels are attached to each other, with brass hinges, so that you can use it as a backdrop. It will show off your Ginny doll to her best advantage! The pink Ginny insignia script logo is on the top of the center panel. The screen is made of wood or wood-type material and approx. 12" high and 14" wide. 1997 Vogue Doll Company Accessory. 6AC06 designed for the 8" Vogue Ginny doll. Mint, new, in original Vogue shipping box.